Global Vantage, Pacific Ridge School's award-winning, student-run magazine is helping save the lives of infants 7,000 miles away. The Upper School service learning group recently donated more than $1200 to help launch Helping Babies Breathe programming in Papua New Guinea - a nation that struggles with high infant mortality rates. Students funded the purchase of five NeoNatalie devices (realistic, inflatable simulators designed to teach basic neonatal resuscitation skills and facilitate role-play of newborn-care scenarios). 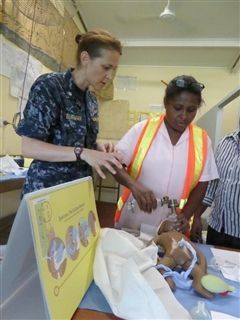 Commander Natalie Burman, wife of Global Vantage faculty advisor Chris Burman, was one of the medical professionals who helped deliver the supplies via the U.S. Navy's Project Handclasp. Using the kits donated by Global Vantage, crew members provided a one-day training course to fourteen nurses, midwives and community health workers. According to Cmdr. Burman, course attendants have already used their newly acquired skills to save lives.